What goes into dressing Steampunk? 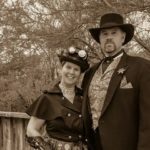 Its not steampunk to say “That’s not steampunk,” so let’s explore layering, foundational garments, accessories, the importance of the thrift shop in character creation and so much more. A hands on display is the highlight of this workshop-lecture. 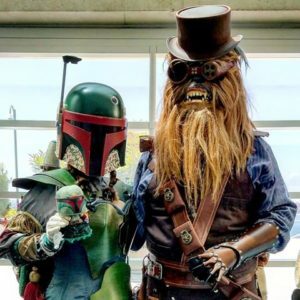 Come explore character creation, costuming, accessories and so much more. This exciting Dynamic Room panel will be led by BexandRedCosplay! 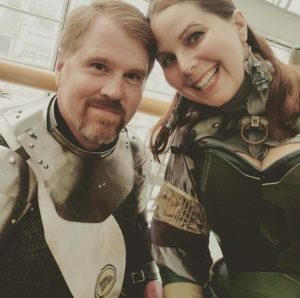 BexandRedCosplay is the cosplay and geek culture home for Matt and Rebecca Eusey. Rebecca is a Royal Guard in the 501st, and has led workshops on persona development, creating costumes on a budget, multicultural steampunk and couples cosplay. Matt has been recognized for his ability to clearly explain complex topics. He’s a leatherworker, painter, and nerf gun modifier.